On August 18, the United States Patent and Trademark Office awarded me a patent for my “reinvented” stretcher bar for professional artists. How does this help you? As a painter, you know the heartbreak of warped wooden stretcher bars. It happens in the studio, in storage, in the gallery, and in your collectors homes. Silently and insidiously twisting your brilliant creation. And worse, if it happens in the gallery or at the collector’s home, the “fix” will be out of your control. Shown here, from right to left, is a cross section of a stretcher bar, an assembled frame, and a frame with canvas attached. 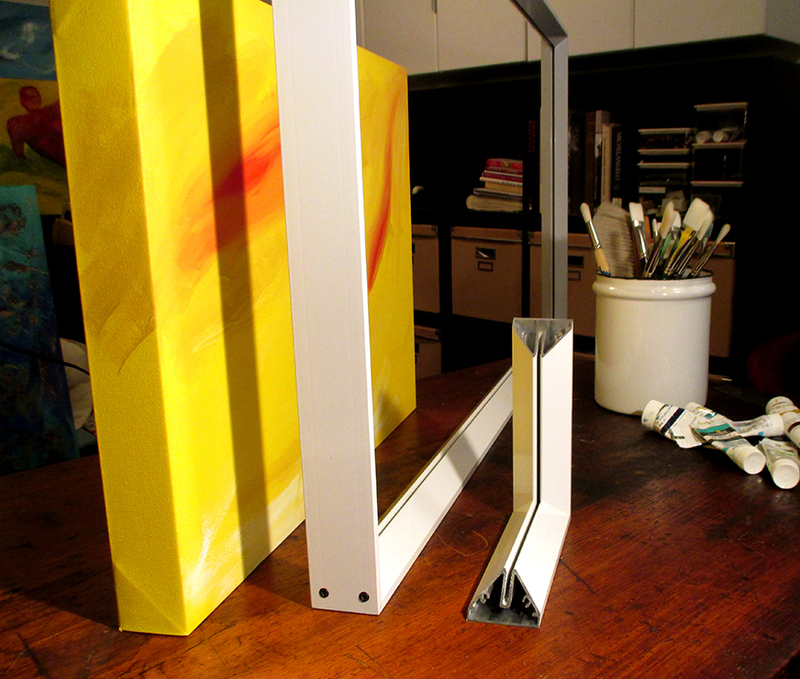 Your paintings will never warp again, if you paint on canvas stretched over my uniquely designed, extruded aluminum stretcher bars. My supports will not warp, expand or contract due to the environment. My design negates torsion or the twisting of the frame due to torque. It’s stronger and lighter than wooden supports. No corner keys, corner-bracing or cross-bracing is needed to keep the canvas square and tight. Cotton or linen canvas can be stretched with more tension without staples or tacks. The canvas can be removed and stretched again in the exact same position without any loss of canvas. Further, the canvas can be shipped broken down by you to your gallery—lowering shipping costs—and then, reassembled by the gallery in less than ten minutes. It is recyclable, sustainable and environmentally friendly. For the full story about my DrumTyght™ Stretcher Bars, visit its website at http://www.drumtyght.com. Let your artist friends know it’s coming in 2016. Posted in Drumtyght Stretcher Bars and tagged Design, extruded aluminum, Stephen Hall, stretcher bars. Bookmark the permalink. Congratulations on your patent Stephen Hall! I look forward to spreading the word about your design and trying the canvases out next year.